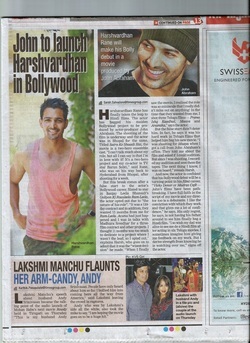 Telugu actor Harshvardhan Rane is excited about making his Hindi film debut in a film produced by John Abraham. Telugu actor Harshvardhan Rane, who is making his Bollywood debut with John Abraham's upcoming production "Satra Ko Shaadi Hain", says he is excited and pleasantly surprised to be launched in this way. "I'm excited as well as pleasantly surprised to have got this opportunity to be launched in Bollywood by John, who is known for introducing new talent. He did that in 'Vicky Donor' and has continued with his latest project," Harshvardhan told IANS. "They have had me in the scanner for a long time but things materialized only now. I believe in John and the work he produces as a producer. It's a Bollywood debut I couldn't have ever asked in my life. I'm extremely happy," he added. "Satra Ko Shaadi Hain", which has gone on floors, also features television actor Barun Sobti. It is being directed by Arshad Sayed. 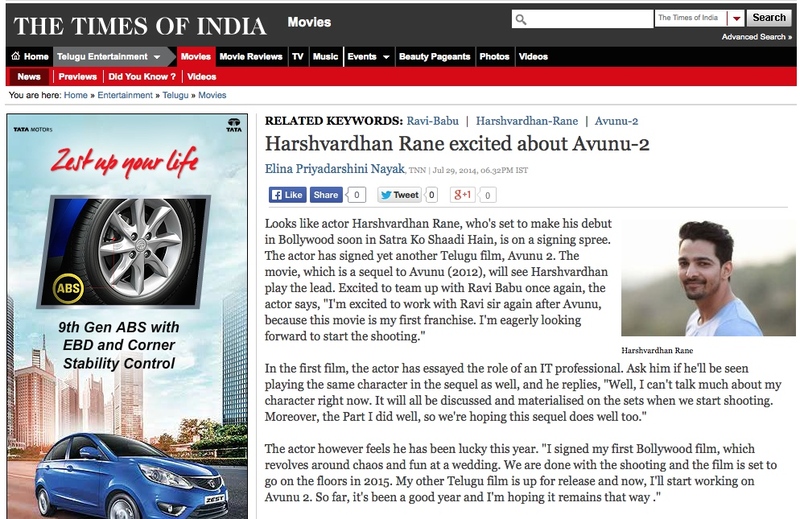 Harshvardhan Rane feels the love of his fans landed him this project. "I know I got this opportunity because of each and every person who asked me when will I go to Bollywood. Somehow their wish went into the universe and this became possible," he said. "I'm a believer of the concept secret. Sometimes I think it's what others wish for you more than what you wish for yourself," he added. The actor was earlier supposed to make his Bollywood debut with Sanjay Leela Bhansali's "Ram-Leela", but he let go of it. "I was asked to dedicate 10 months for a small role in the film. I finished three Telugu films during that time period. Bhansaliji once told me that I should choose the right films and I applied it to his offer only," he said. He is currently awaiting the release of Telugu psychological thriller "Maaya". 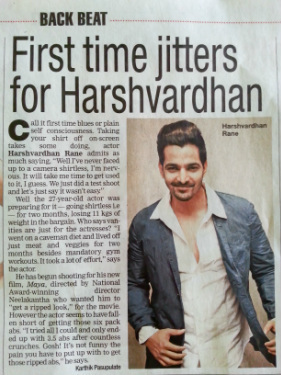 ‘Maya’ is one more addition to young actor Harshvardhan Rane list of films as hero. Neelakanta of Missamma and Mr.Medhavi fame is the director. The movie is going on to floors for shooting its first schedule on 28th of October. Neelakanta is in search of new Heroienes to Introduce through ‘Maya’. Musical score by sekhar Chandra. Neelakanta is an award winning director. He has his unique style of story presentation on screen. Neelakanta this time coming up with a different type of concept. Extra sensory perception is the base for the story line of his upcoming movie ‘Maya’. Dr.M V K Reddy is the producer on Shiridi Sai Combines Banner. Madhura Sridhar Reddy is the presenter.Other details of the movie are to be announced. Southern actor Harshvardhan Rane, who essays an important role in "Anaamika", the southern remake of "Kahaani", says its director Sekhar Kammula is the reason why the film is special. 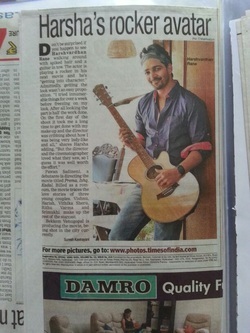 Harshvardhan even says that it is because of the director that he agreed to be a part of the film. "There are three reasons why I said yes to this film. First of three reasons is Sekhar sir, second is because Endemol is associated with the project and finally, I believed in my instinct," Harshvardhan, who also wants to avoid playing similar roles, told IANS. "I recently finished shooting for a film in which I play a rockstar. I wanted to do something far different from it and that's precisely when this project was offered to me. It's a precious project and I'm happy to be a part of it," he added. The actor is paired opposite Nayantara in the film, which is currently being shot in Hyderabad. "I can't talk about the role, but I play an important role. I have completed about 10 days of shooting and there are few more days of shoot left," he said.Harshvardhan says he wasn't apprehensive to feature in a remake. "First of all, it's an adaptation of 'Kahaani'. I don't know how others call it, but I don't see it as a remake. I wasn't scared to be part of it because I have nothing to lose as an actor. "I don't come from a film family background and therefore I don't have to keep any flag flying high. Sometimes you follow your instincts because you feel it's going to be right. I just did that because I had the urge to work with Sekhar sir," he added. Working with Nayantara for the first time, Harshvardhan felt some jitters, but he says she "made me feel comfortable as soon as she realised I started feeling nervous around her".Nayantara reprises the role of Vidya Bagchi, which was originally played by Vidya Balan in "Kahaani". The film also features Pasupathy and Vaibhav Reddy in important roles. After the suspense thriller Avunu,Harshvardhan Rane is acting in Prema Ishq Kadal directed by Pawan and produced by Lucky Media. The story is about three different guys, and Harsh is one of the leads. Vitika is cast opposite him. Vishnu and Harish play the other roles. “I play a rock star in the film. My character is called Randhir (Randy) and I’m also a coffee shop owner. These coffee shops are a big trend today and close to the youth. People are also into music, so the character is close to today’s youth,” says Harsh in this exclusive chat. Shooting for Prema Ishq Kadal has just begun and Harsh is excited about his new look in it. Since he’s a rock star, he has to play the guitar. “I know the basics of the acoustic guitar; I’m learning to play the electric one now. “The story is sweet with a lot of entertainment. I know the team behind the project. Director Pawan was involved with the short film Infinity that I did. The DOP Karthik Ghattamaneni shot Infinity,” adds Harsh who is currently shooting scenes in a coffee shop on a set erected for the purpose.